Etymology: "Japanese Pagodatree" reminds it is frequently close to pagoda. "Honey tree" comes from its melliferous flowers. Origin: China (and not Japan! ), introduced into Europe, by the French father Pierre d'Incarville (he stays in Beijing from 1742 till 1757). Habitat: Japanese Pagodatree is a tree of light. It tolerates drought, heat and fits to urban places. It prefers fertile soils and deep, not too calcareous and ever loamy. Quick growth. The wood is brittle. Pinnate deciduous leaves which resemble those of the Locust tree, but leaflets are smaller and acuminate. Besides their trunks are distinctly different. The base of the leaves of japanese pagodatree is bulbous, and contains the bud. The leaves of the japanese pagodatree are the last to appear, long afterwards those of others big trees, and also the last to fall in autumn (in November). Leaflets turn yellow and break loose one to one. Flowers are doubly late: they wait untill August to hatch and this, only after 20 years! They gather in pendulous panicles, 30 cm long, surrounding the shaft of a vaporous cloud, creamy white, fragrant and melliferous. Progressively when the small flowers hatch on the same panicle, the most ancient of some days fade already and spread a white carpet on the soil. Tradition: tree of pagodas, in China. Uses: in China, buds serve for dyeing silk in yellow. 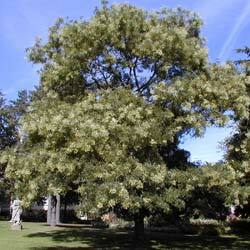 The wood of Japanese Pagodatree is brown-greenish and resistant. The Japanese use it in carpentry. Japanese Pagodatree is a nice alignment and ornamental tree. It takes part well in successive pruning, which give it the desired form.